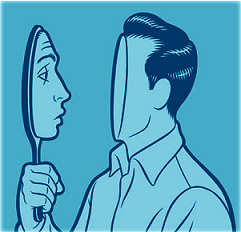 So, who is this inner self? Most of us engage in some continuous inner dialogue but not with the self. We are constantly running an imaginary dialogue with our adversaries, the people we disagree with, the loved ones, and the people we are trying to impress. These internal dialogues start as an aftermath of some event. An indeterminate future conversation, and various versions of the same, start in the mind and continue for a long time. These dialogues are different from the dialogue we have with our inner self. Almost all the people experience this inner voice on a frequent basis – but choose to ignore it. People may spend all life never ever experiencing a conversation with the inner voice. They are rarely affected by the entrapments of their dharmic dilemmas. The more we ignore the inner voice the more strongly it comes at us at a future time. Example: A corrupt politician, who completely ignored the inner voice, will have to spend a lot of time with a much bigger, stronger and louder inner self when he/she is thrown behind the bars. All the others in their old age. Too late. Enough said about the inner self! So, when do you say that you are having a conversation with the inner self? Most often it is during a desire-free-prayer or during a silent(mantra-less) meditation one can experience this conversation with the self. When you do something really good or something really bad, a sense of deep satisfaction or a sense of deep guilt sets in. In both these cases you are likely to experience a conversation with the self. Unfortunately we do not allow ourselves to engage in that conversation. In my case I stubbornly engaged myself in that conversation and experienced a rare sense of my own being. What are the side effects of the conversations with the inner self? A fruitful conversation with the self always helps us in being good, seeing good and doing good. We tend to have a difficult conversation with our inner self when we are struggling to wriggle ourselves out of our bad habits, when we have a long list of unfulfilled desires, an unending list of tasks screaming at us, and a sustained inability to complete personal projects in a timely manner. My experience with my inner core has been a long difficult one. I am still struggling to make it a fruitful one. As for the side effects, we tend to blame everything else in the world starting from the weather to those four sentences of our horoscope in the daily newspaper! An inner voice that is trying to counsel you with the wise words, “No, it is not others, it is you”, will fall on those metaphorical deaf ears. If you are like me, you probably experienced serious disagreements with your spouse. I did. Fortunately I retracted much before any serious damage occurred. If it is not handled well we might experience previously unknown levels of depression and desperation. I have experienced a little bit of both. A peace pact with myself is currently a work in progress. Is the secret to happiness connected to our inner self? I now realize that in order to be happy it is important to have a healthy relationship with our inner self. In order to have that healthy relationship we have to ask ourselves what is it that is most important to us. We should accord top priority to the most important things and renegade everything else to the dustbin. I think we should make it a habit to keep focusing on the most important things and develop a fine art in skillfully discarding everything else. I think that will help and I think that is the real secret to happiness. Don’t we know this already? I did, but I never dealt with it as seriously. I am sure there are many ways to identify what is important to us. We just have to continue our conversations with the inner self to find out. Keeping open this line of communication with the inner self is the most important thing that will eventually draw our attention to all the other important things in life. How do we find out what our top priorities are, when it is the ego that dislikes truth, that is driving most decisions? We need to figure out what the most important things are, by being absolutely honest or true to ourselves. However being true to oneself requires removing decades of conditioning and is very very hard. No wonder I spent decades of my life letting the society/others control my life, because that seemed easier than facing my true self. Previous post: Are We Prepared To Handle Ourselves? Next post: Why is it difficult to deal with ourselves?